I've been using rewards sites to earn extra cash and Amazon gift codes since probably 2007 — when my oldest was just a baby. This was also when I first began to seriously look for ways to make money from home. Of course, it didn't take long for me to realize that these rewards sites were in no way going to replace my income, but I still found them to be a bit addictive. I got in the habit of logging in to a few of them every day to earn redeemable points or cash. 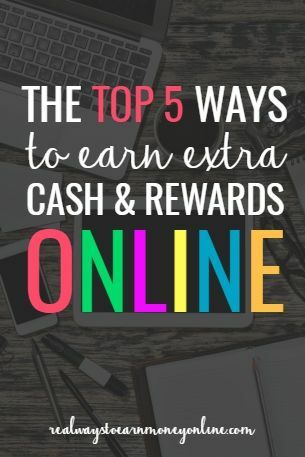 Rewards sites offer multiple ways to earn a little money or rewards (gift codes to popular retailers, merchandise, etc.). Once your account is created, you can log in as often as you want and do simple little tasks like searching the web, filling out surveys, watching videos, playing games, doing short tasks, printing out coupons, doing offers, shopping, referring your friends, and all kinds of other things. Everything you do earns you points or cash. All of these sites will have a threshold you have to meet before you can redeem for your earnings or whatever gift cards you want. Once you've earned enough money or gotten enough points, then you can cash out. I like to let these small amounts build up, and then cash out around Christmas to help me buy gifts. You'd be surprised how fast it will add up if you use them daily. Which rewards sites do I recommend? There are many sites like these, but the following five are the top dogs. They are the most popular, the oldest, have the most members, and have great track records when it comes to payments. #1 – Swagbucks – Read Swagbucks Review – This is the first one I ever used, and it still may be my favorite. They pay in virtual “swagbucks” you can use to redeem for Amazon codes (500 bucks is $5), Paypal cash (2,500 bucks is $25), and all kinds of other things. They used to be a little sluggish on sending your redemptions, taking as long as a few weeks, but just recently a reader told me they've seriously sped up and now you can get paid much faster. They've been around since 2007. #2 – My Points – Read MyPoints Review – This site got started back in 2004 and was originally more of a cash-back for shopping site, similar to Ebates. However, they've really branched out since then and added all kinds of ways to earn money. You can earn gift cards and Paypal cash through MyPoints. A $10 Amazon code will cost you 1,700 points and $25 to Paypal costs you 4,550 points. They have a ton of other options as well. #3 – Earning Station – Read EarningStation Review – This is a newer rewards site that has become pretty popular. There are lots of ways to earn — the typical stuff like surveys, offers, games, videos, and shopping. They tend to have a lot of surveys. You can request to be paid via gift cards or Paypal payments. You must be at least 18 to join and a US resident. #4 – Inbox Dollars – Another site that's been around for years. Unlike Swagbucks, Inbox Dollars doesn't operate off a virtual currency or points. Everything you do on the site earns you straight up cents or dollars, and they pay via mailed check. The only negative with Inbox Dollars is that you can't ask for a payment until you have $30 in your account which is a little high in my opinion. However, when you sign up, they give you $5 right off so that gets you a lot closer to that number. They've been around since 2000. #5 – Cash Crate – I love the way this one is set up. They have a very clean interface and I've always found it really easy to navigate around. Cash Crate has ways to earn both cash and points. They'll mail you a check once you've hit $20, or you can use your points to redeem for things like Amazon gift certificates, pre-paid Walmart cards, and more. They've been around since 2006. Most of these sites now have mobile apps, so you can tinker around with them even when you're not at home. A great time to do this would be when you're in “wait” mode — waiting at the doctor's office, or waiting in line somewhere. Rewards sites also have referral programs and allow you to share on social media when you've earned points or redeemed for something. This is a very effective way to get a few of your friends signed up under you, and you'll reach your cash out thresholds much faster this way because you'll always earn when your referrals do. The small amounts add up with these sites. Definitely don't look at this as a “job” because if you were to calculate it per hour, you for sure won't be paid even minimum wage. I would also not recommend spending all day on these sites, like you would with a real job. Just logging on here and there once a day for maybe 10-15 minutes at a time will equal progress and extra money earned. Curious about ways to earn money with your opinion? While rewards sites do offer paid surveys as a way to earn cash online, there are plenty of survey panels you can use in addition to these that specialize in JUST surveys. However, there are a ton of them! If you're not sure which are the best to use, you can refer to my list here. Paid surveys are a great, legit way to earn extra cash here and there online. Love Swagbucks, but I am interested in using Inbox Dollars as well! Wasn’t sure how reputable it is but I have heard lots of good reviews. It is one of the most reputable for sure, and they always pay. The only thing I don’t like about Inbox Dollars is having to get that $30 to cash out. That can take a while. It’s just not possible to get paid as quickly with them as you can with the other sites I’ve listed. I tried out the site yesterday and I like it! The only thing I am skeptical about are the offers. They lead you to some shady sites that I desperately wish I didn’t have to enter my address into… otherwise I’d be all for them! Yes, some of the offers I wouldn’t bother with. In the past, I would usually only do the offers if they were through a reputable company that I’d heard of before. I use Swagbucks and MyPoints also. I enjoy the gift cards I earn once in awhile. Too bad it can’t replace having a job.